This is modern day master piece from one of the leading British figurative artists. Charles Hardaker produces paintings of calm reflection with an enduring appeal. 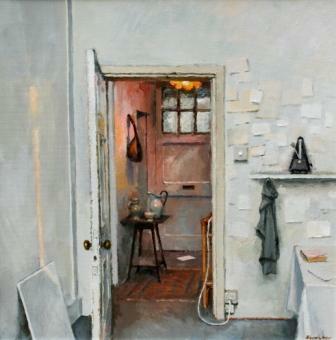 In this painting Charles Hardaker shows his fascination with light and shade and the sense of texture they can create. In these small vignettes Charles Hardaker employs objects from his studio to create a still-life ''set''. The door, open, allows light into the scene and creates interest in what else might be beyond. Hardaker sees the qualities of shape and form as transformed by light and shade in the most ordinary of objects and great skill is to treat each element with care and affection.